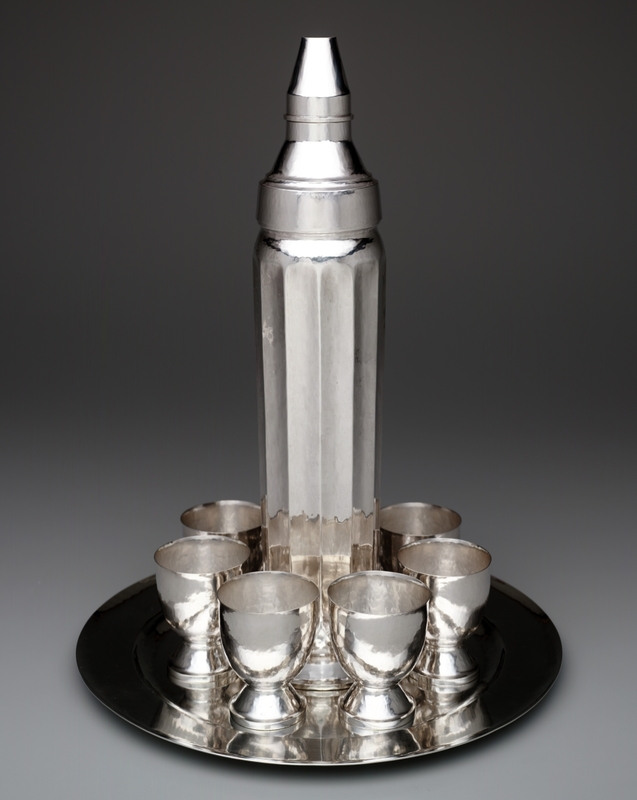 Cocktail shaker and cups, Wallace Brothers Silver Company, manufacturer, Bridgeport, Conn., 1928. Silverplate and glass. DALLAS, TEXAS – Consuming copious amounts of festive libations is a time-honored social custom, especially this time of year. 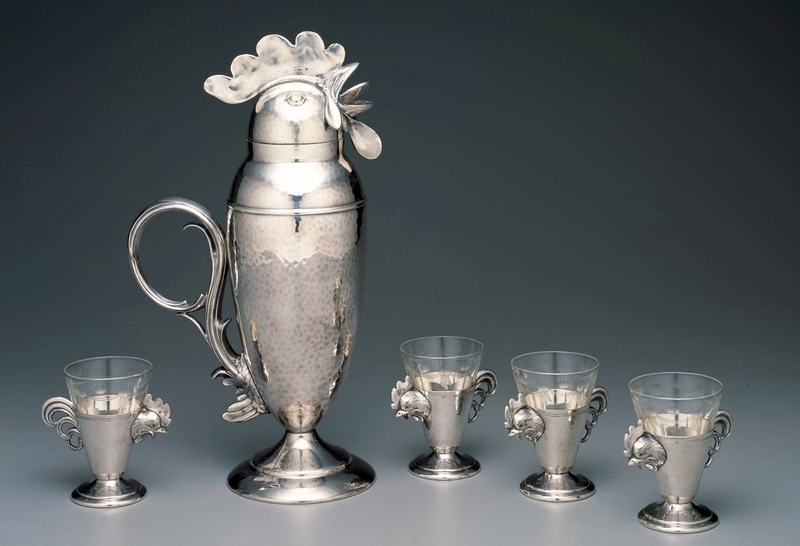 From punch bowls to puzzle jugs, the accoutrement of drink is at least as inviting as the substance itself, as a new exhibition on view through November 12, 2017, at the Dallas Museum of Art suggests. Known for its fine collection of Twentieth Century decorative arts, especially silver, the institution explores the fancy and folly of social drinking in “Shaken, Stirred, Styled: The Art of the Cocktail.” Drawn from the museum’s collection and enhanced by select area loans, the presentation offers a playful array of bowls, buckets, shakers, glasses, barware, books and ephemera, all in the service of chronicling the art and culture of the cocktail from the late Nineteenth Century to the present. In 1806, a Hudson, N.Y., periodical defined the cocktail as “a stimulating liquor, composed of spirits of any kind, sugar, water and bitters.” The cocktail was enshrined in the first guide to the subject, How to Mix Drinks: or, The Bon-Vivant’s Companion, published in 1862. The book compiled the recipes of bartender Jerry Thomas (1830-1885), who began as a saloon keeper in New York City. As the “father of American mixology,” Thomas influenced the hospitality industry across the country. His compendium includes drinks still fashionable today – among them the mint julep, the old-fashioned, the Manhattan and the martini – plus others now forgotten. The quintessential showman, Thomas was best known for the Blue Blazer, a concoction, first served at a San Francisco gambling parlor, that involved, among other things, setting a flame to whiskey. 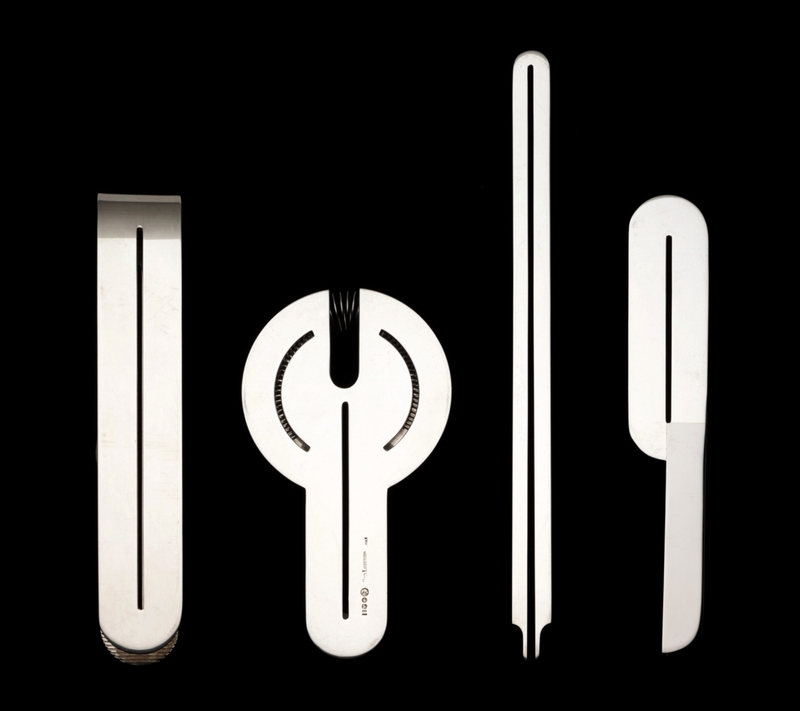 With new drinks came a profusion of singular glasses, mixing and serving vessels and specialized tools, among them shavers, picks, tongs, strainers and long-handled spoons. These idiosyncratic wares are at the heart of the display, which divides the history of the cocktail into three broad eras. Called “The Great Experiment,” the first era, from 1919 to 1928, was a backlash to the Temperance Movement and Prohibition. 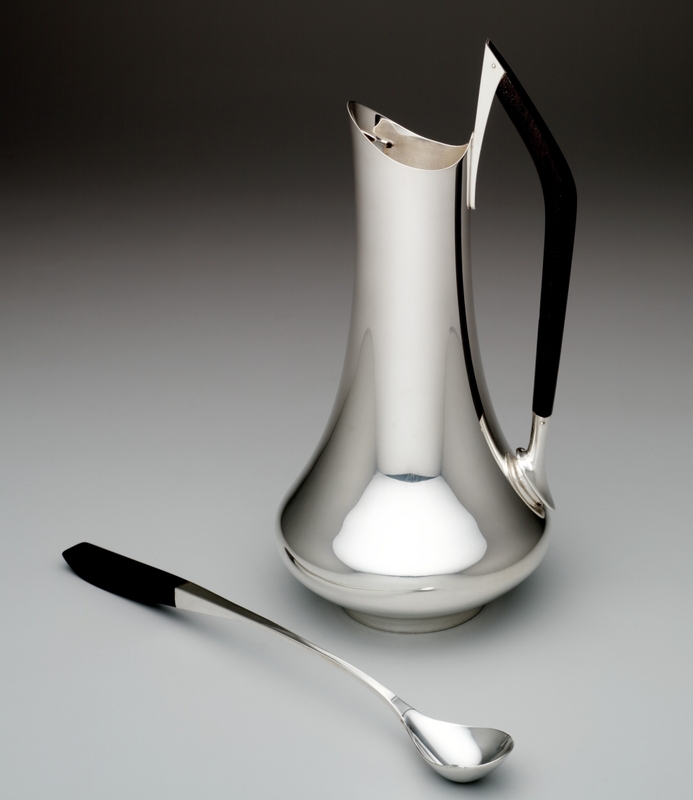 Silver and silverplate shaker sets by Gorham Manufacturing Company, International Silver Company, Manning Bowman Co. and others were commonplace in the 1920s American home. They came in amusing figural forms or were fashioned in the glamorous Art Deco or Moderne styles. Marked by economic and social hardship, the second era stretched from 1928 to 1944 and was characterized by the more modest consumption of alcohol. After 1945, Americans embraced modernity and took an increasingly relaxed approach to entertaining at home. 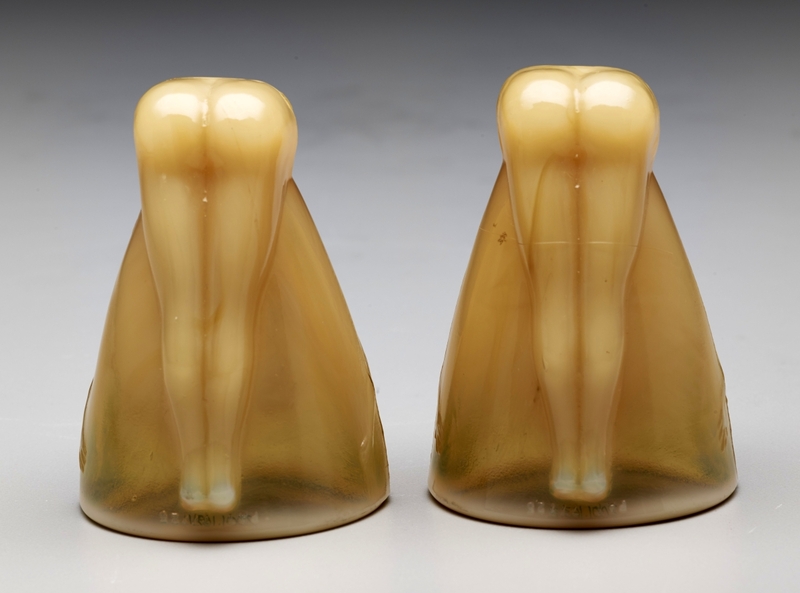 Social change was reflected in designs by Russel Wright and other midcentury makers. “Wright and his wife, Mary, outlined the new rules of hospitality and etiquette in their 1950 lifestyle manual Guide to Easier Living,” the curator explains. Martini glass designed by Valeri Timofeev, circa 2001. Silver gilt, plique-à-jour enamel, enamel and unidentified hardstone. Trends in the later half of the Twentieth Century include less fussy approaches to home entertaining and a new reliance on drink mixes, bottled ingredients and time- and labor-saving devices such as blenders. Gin and, later, vodka martinis grew in popularity, as did frozen drinks such as daiquiris and margaritas. “The aforementioned new products, along with those of previous eras like cocktail shakers, assumed styles that evoke modernity, from the playful biomorphism of the 1950s and early 1960s to the Scandinavian austerity of the late 1960s and 1970s,” write the organizers. 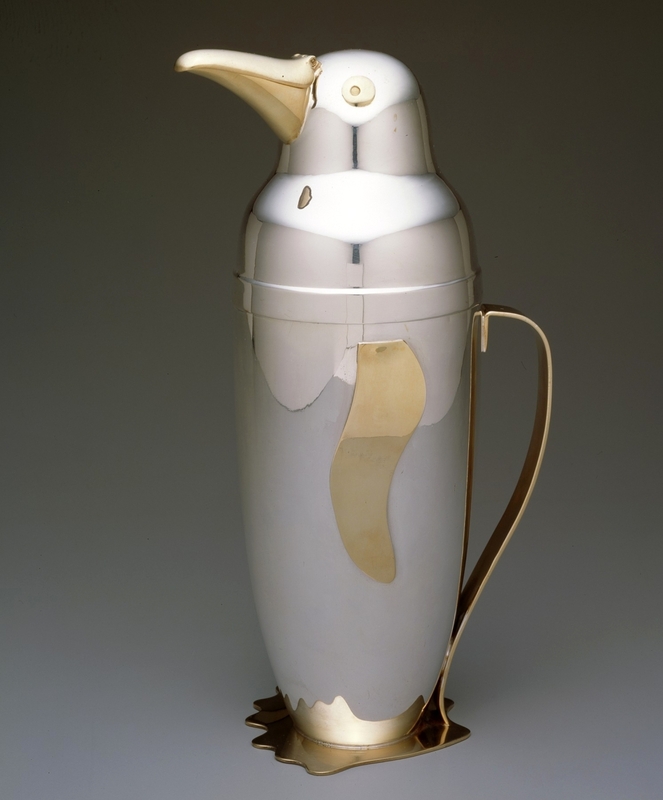 Featuring more than 60 objects in metal, glass, ceramics and plastic, the show ranges from Nineteenth Century punch bowls to modern barware and contemporary glassware. Pieces are organized chronologically. The interactive display includes videos featuring demonstrations with Chad Solomon and Christy Pope of Cuffs & Buttons, a beverage consulting and catering company in Brooklyn, N.Y., and Midnight Rambler, a craft cocktail salon in the Joule Hotel in Dallas. 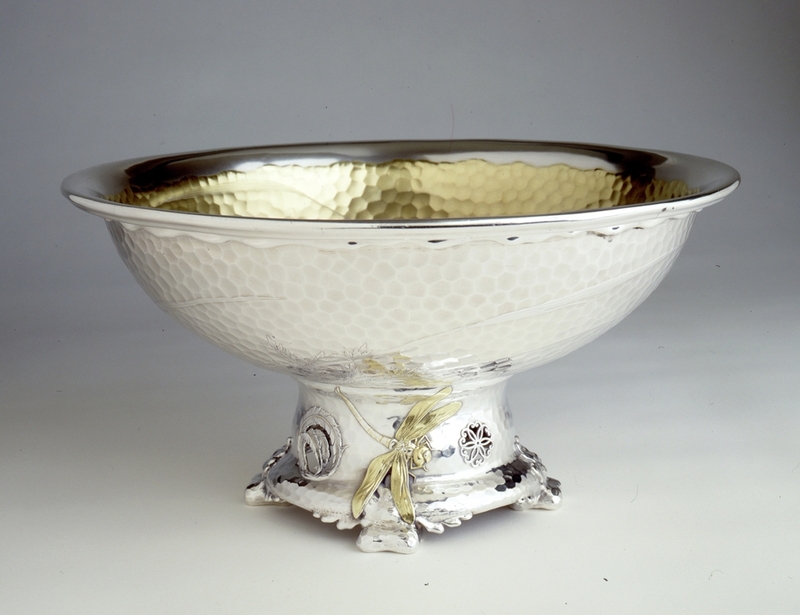 One of the earliest items in the show is a hammered silver and silver-gilt Tiffany & Co. punch bowl. Made in 1881, at the height of the Aesthetic Movement, it reflects the influence of Japonism. Anyone familiar with Jazz Age decorative arts will recognize the great “Jazz” or “New Yorker” bowl. 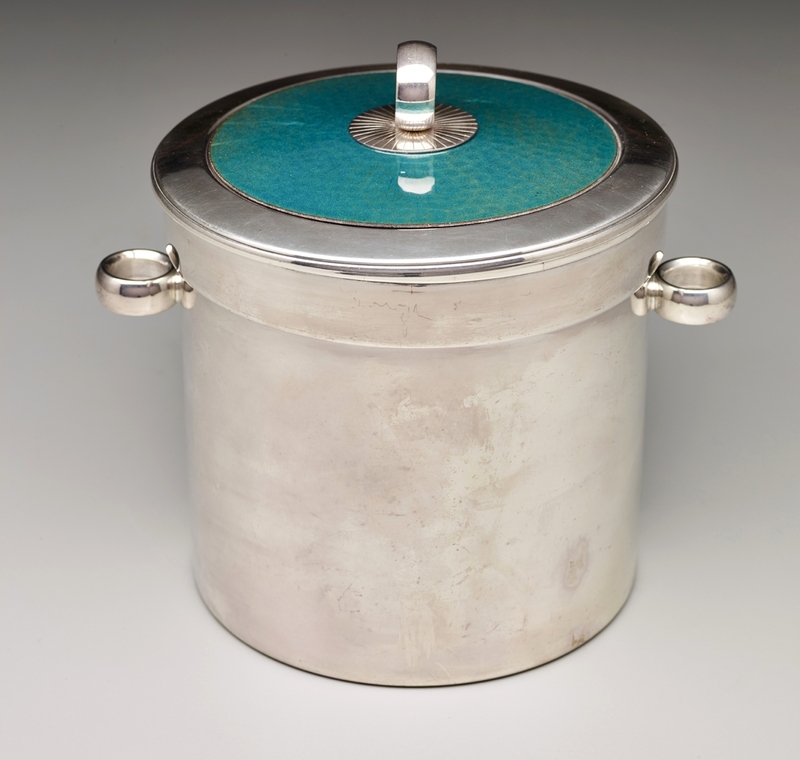 Commissioned by Eleanor Roosevelt and designed by Viktor Schrenkengost, this vivid black and turquoise vessel was made by Cowan Pottery Studio circa 1930-31 and is one of a handful of examples of its kind known. 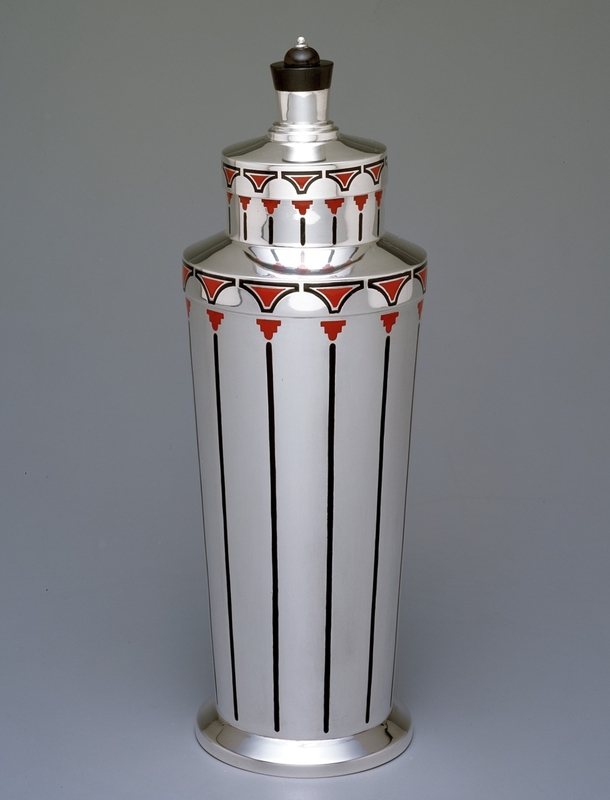 The skyscraper is invoked in cocktail shaker sets designed by William Waldo Dodge Jr and Norman Bel Geddes, whose Art Deco “Manhattan” set is a classic articulation of the Streamline Modern style. 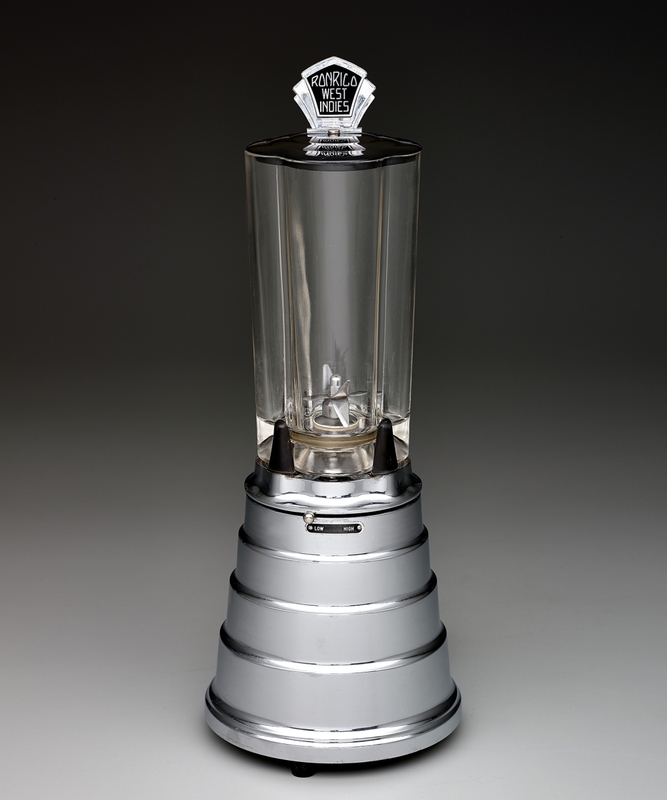 The wide, conical bowl of the martini glass was designed to enhance aroma by exposing more liquid to air, while the long stem helped keep the drink cold. The shape grew in popularity in the 1960s and 1970s, thanks to some very good publicity from the film character James Bond, whose mantra “shaken, not stirred” organizers borrowed for the show’s title. 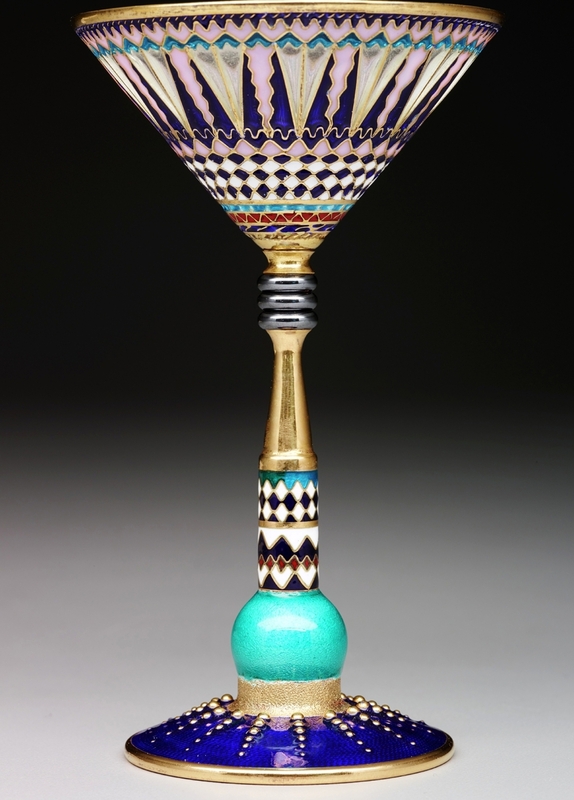 One of the newest pieces on view is an opulent hardstone and enameled silver-gilt martini glass designed circa 2001 by Valeri Timofeev, a Latvian-born, Russian-trained artist. “Circa ‘70” pitcher-mixer with mixer spoon, Gorham Manufacturing Company, manufacturer, Providence, R.I., designed 1960. Silver and ebony. Other highlights include a first edition of Jerry Thomas’s How to Mix Drinks: or, The Bon-Vivant’s Companion, shown alongside a interactive digital version of the same. Also displayed is the 1930 publication The Savoy Cocktail Book by Harry Craddock with illustrations by Gilbert Rambold. This particular volume belonged to Neiman Marcus president and chairman H. Stanley Marcus. Handwritten inscriptions suggest the book was well used. All the more reason to lift a glass to the Dallas Museum of Art and this fascinating exhibition. The museum plans a password-only speakeasy on February 4 featuring a costume contest, live music from the 1920s and 1930s, dance tutorials, novelty gambling tables and Prohibition-inspired cocktails. Established in 1903, the Dallas Museum of Art is among the ten largest US art museums, with collections encompassing more than 23,000 works spanning 5,000 years. The Dallas Museum of Art is at 1717 North Harwood. For information, 214-922-1200 or www.dma.org. 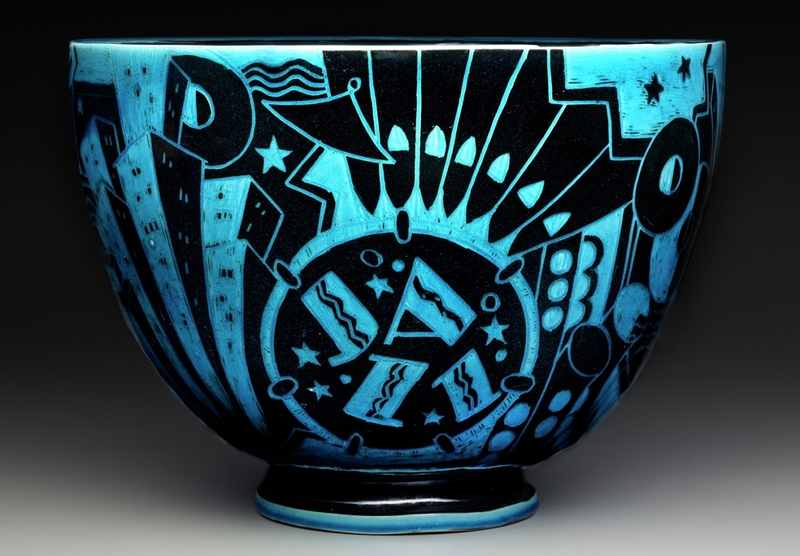 “Jazz” or “New Yorker” bowl, Cowan Pottery Studio, maker, Rocky River, Ohio; Viktor Schreckengost, designer; circa 1930-31. Earthenware.